Pat Summit, the University of Tennessee coach garnered eight championships in her 38 seasons and notched 1,098 career victories, more than any other Division I basketball coach. Patricia Sue Summitt (née Head, June 14, 1952 – June 28, 2016) was an American college basketball head coach whose 1,098 career wins is the most in NCAA basketball history. 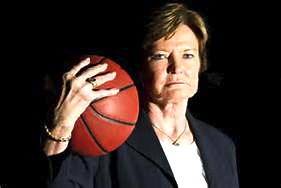 She served as the head coach of the University of Tennessee Lady Vols basketball team from 1974 to 2012, winning eight NCAA championships (an NCAA women’s record when she retired), and surpassed only by the 10 titles won by UCLA men’s coach John Wooden and the 11 titles won by UConn women’s coach Geno Auriemma. She was the first NCAA coach, and one of four college coaches overall, with at least 1,000 wins. Summitt also won two Olympic medals: a gold as head coach of the 1984 U.S. women’s basketball team and a silver as a player on the 1976 team. She was named the Naismith Basketball Coach of the Century in 2000. In 2009, the Sporting News placed her at number 11 on its list of the 50 Greatest Coaches of All Time in all sports; she was the only woman on the list. In 38 years as a coach, she never had a losing season. 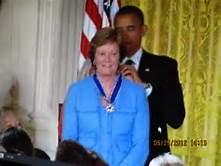 In 2012, Summitt was awarded the Presidential Medal of Freedom by President Barack Obama and received the Arthur Ashe Courage Award at the 2012 ESPY Awards. Summitt wrote three books, all with co-author Sally Jenkins: Reach for the Summitt, which is part motivational book and part biography; Raise the Roof, about the Lady Vols’ 1997–1998 undefeated and NCAA-championship winning season; and Sum It Up, covering her life including her experience being diagnosed and living with Alzheimer’s disease. She had four siblings: older brothers Tommy, Charles and Kenneth, and a younger sister, Linda. She married R. B. Summitt in 1980; the two filed for divorce in 2007. They have one son, Ross Tyler Summitt, born in 1990. When Summitt was in high school, her family moved to nearby Henrietta, so she could play basketball in Cheatham County because Clarksville did not have a girls team. From there, Summitt went to University of Tennessee at Martin where she was a member of Chi Omega Sorority and won All-American honors, playing for UT–Martin’s first women’s basketball coach, Nadine Gearin. In 1970, with the passage of Title IX still two years away, there were no athletic scholarships for women. Each of Summitt’s brothers had gotten an athletic scholarship, but her parents had to pay her way to college. 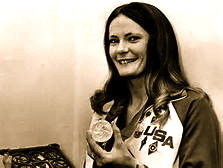 She later co-captained the first United States women’s national basketball team as a player at the inaugural women’s tournament at the 1976 Summer Olympics, winning the silver medal. Eight years later in 1984, she coached the U.S. women’s team to an Olympic gold medal, becoming the first U.S. Olympian to win a basketball medal and coach a medal-winning team. Tyler Summitt, who played as a walk-on for the Tennessee men’s basketball team, graduated from Tennessee in May 2012, was hired as an assistant coach by the Marquette University women’s team effective with the 2012–13 season. In what ESPN.com columnist Gene Wojciechowski called “a bittersweet irony,” Tyler’s hiring by Marquette was announced on the same day his mother announced her retirement. During Summitt’s first year as head coach, four of her players were only a year younger than she was and all were from Tennessee high schools, which until 1980 employed a six-person game where offensive and defensive players never crossed mid-court. She coached her first game for Tennessee on December 7, 1974 against Mercer University in Macon, Georgia; the Lady Vols lost 84–83. Her first win came almost a month later when the Lady Vols defeated Middle Tennessee State, 69–32 on January 10, 1975. The Lady Vols won the Tennessee College Women’s Sports Federation (TCWSF) Eastern District Championship for the third straight year. However, the team finished 4th overall in the TCWSF (they had been second the previous two years), and were not invited to the Association for Intercollegiate Athletics for Women (AIAW) tournament. In her second season, Summitt coached the Lady Vols to a 16–11 record while earning her 1976 master’s degree in physical education and training as the co-captain of the 1976 U.S. Women’s Olympic basketball team that won a silver medal in Montreal. Starting with the 1976–77 season, Summitt directed two 20-win teams, winning back-to-back AIAW Region II championships. The Lady Vols defeated 3-time AIAW champion Delta State by 20 points in 1978, and earned Tennessee its first number one ranking. 1978 saw the Lady Vols participate in their first AIAW Final Four, where they finished third. Summitt also recorded her 100th win during this season, a 79–66 victory over NC State. Tennessee closed the 1970s by winning the first-ever SEC tournament, and returning to the AIAW Final Four, where they finished runner-up to Old Dominion, 68–53. During the 1980–81 season, the Lady Vols went 25–6, and avenged their championship game loss to Old Dominion by defeating them three times. The team made it to the AIAW Final Four for the third straight year; finished runner-up for the second consecutive year, losing to Louisiana Tech, 79–59. The 1981–82 season featured the first ever NCAA Women’s basketball tournament. The Lady Vols were one of 32 teams invited and named a 2 seed in their region. In the region championship, the Lady Vols upset top-seeded USC 91–90 in overtime to advance to the Final Four. They lost their Final Four match-up with Louisiana Tech, which went on to win the tournament. The next season, the Lady Vols won the regular season SEC title but fell in the SEC tournament to Georgia. Tennessee was invited to the now-36 team NCAA tournament and awarded its first-ever 1 seed. Tennessee made it to the regional championship, but fell to Georgia again, 67–63. Summitt won her 200th game on December 3, a 69–56 victory over St. John’s during the Coca-Cola Classic in Detroit. The 1983–84 season saw Tennessee start out 6–4. However, Summitt rallied her team and finished 22–10, for her eighth straight 20-win season, a streak that still continues. Tennessee not only made it to the NCAA Final Four for the second time in the first three tournaments, but also made it to the title game. However, Tennessee lost by 11 to USC, which also had won the title the previous year. 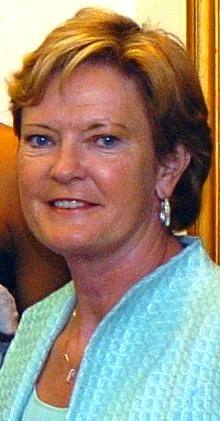 Pat Summitt earned Coach of the Year honors. This season was followed up by another 20-win year in which Tennessee earned both the regular season SEC title (despite only going 4–4) and the tournament title. However, the Lady Vols fell in the NCAA Tournament to Ole Miss during the round of 16. The next season was a similar story – the Lady Vols had a good regular season, played a great tournament (reaching the Final Four for the second time in three years), but fell before winning the title. In 1986–87, Tennessee broke through and defeated perennial power Louisiana Tech 67–44 to win the Lady Vols first national title. Tennessee’s Tonya Edwards was named the Most Outstanding Player in the Final Four. During the regular season, Summitt also earned her 300th win, an 87–66 victory over North Carolina. The next year in 1987–88, the Lady Vols were positioned to repeat as Tennessee made it to the Final Four yet again. However, Louisiana Tech avenged the previous year’s championship game loss with a 9-point victory and went on to win the title. In 1988–89, the Lady Vols reached the Final Four for the fourth straight year. After eliminating Maryland by 12 points, Tennessee faced SEC rival Auburn for the national title. Auburn had lost by two points to Louisiana Tech in the NCAA title game the previous year and had suffered its only loss in the SEC Championship game by 15 points to Tennessee. The championship game was similar as Tennessee took home its second title in three years with a 76–60 victory. It was Tennessee’s best season yet; the Lady Vols won 35 games while losing only a two regular season contests to Auburn and Texas. The Lady Vols won every NCAA tournament game by at least 12 points. In 1989–90, the Lady Vols started off the season well, winning the SEC title. However, the team fell by 1 point to Auburn in the SEC Championship Game and lost in overtime to Virginia in the regional finals, one game shy of making a trip to the Final Four, which that year was held in Knoxville. Summitt accomplished another milestone that season with her 400th win, a 70–69 victory over South Carolina on January 25. In the 2000–01 season, the Lady Vols claimed another SEC title, winning all 14 SEC games. Additionally, they split the season series with the UConn Huskies and headed into the SEC tournament with a 28–1 record. However, the Lady Vols were upset by Vanderbilt in the semifinals and then lost in the Sweet Sixteen to Xavier, their worst finish since 1993–94. During the regular season, Summitt earned her 750th win in the second game against UConn, a 92–88 victory. The team also finished with its fourth straight 30-win season. In the 2001–02 season, The Lady Vols won their fifth straight SEC championship, but fell again in the conference tournament, this time to LSU. In the NCAA tournament, Tennessee reached the Final Four again, with a 5-point win over Vanderbilt University. This trip to the Final Four marked Summitt’s 13th appearance, which broke Coach John Wooden’s record of 12, and earned her 788th win, which tied Summitt with Jody Conradt for the winningest coach in women’s basketball history. However, the Lady Vols fell in the national semifinals to Connecticut, which wound up winning the championship and capping an undefeated season. This loss ended the season at 29–5, one win shy of extending Summitt’s streak of 30-win seasons. Summitt did achieve more milestones during the season; a 106–66 win over USC marked Summitt’s 200th win at home, a victory against Louisiana Tech was her 300th win against a ranked opponent and her 93–65 win over Arkansas was her 1,000th game as a coach, including international contests. During the 2002–03 season, the Lady Vols compiled their 6th perfect SEC season and beat powerhouses Duke and Louisiana Tech, among others, during the regular season, but lost to Texas and UConn. In the NCAA tournament, the Lady Vols made it to the title game only to lose to the Huskies again 73–68. During the season, Summitt earned her 800th win, 76–57 over DePaul and was the fastest coach to reach this milestone. The 2003–04 season was similar to the previous year. The Lady Vols defeated most of their regular season opponents, including Duke and Louisiana Tech, but dropped games to UConn and Texas. The Lady Vols again went 14–0 in the regular season against SEC competition, but again fell in the conference tournament. Tennessee won five games in the NCAA tournament only to lose 70–61 to Connecticut in the championship game for the second year in a row and third time in five years. In 2004–05, Tennessee broke its losing streak against Connecticut with a narrow 68–67 regular season victory. Candace Parker, a highly regarded and nationally known high school player joined the Lady Vols. However, because of injuries, she was redshirted and didn’t play that sesson. Tennessee suffered losses during the regular season to Duke, Rutgers, and LSU, while beating Stanford and Louisiana Tech. LSU’s win over Tennessee gave the Tigers the SEC title, breaking Tennessee’s streak of seven straight regular season conference championships. However, Tennessee won its first tournament title in four years by avenging its earlier loss to LSU loss with a 67–65 win in the SEC Championship game. In the NCAA tournament, Tennessee advanced to its fourth Final Four in a row by defeating a Rutgers team that had beaten them earlier in the year. In the Final Four, the Lady Vols blew a 16-point lead to fall 68–64 to underdog Michigan State. In the second round of the NCAA Tournament, the Lady Vols defeated Purdue. This victory gave Pat Summitt her 880th win, breaking North Carolina coach Dean Smith’s record of 879 wins, and making her the all-time winningest coach in NCAA basketball history. By 2005–06, Candace Parker had recovered from her injuries and became a starter. During the season, the Lady Vols dropped three games to SEC foes, LSU, Florida, and Kentucky, to record their worst SEC season since the 1996–97 season. However, they won their second straight game against Connecticut and rebounded from a sub-par SEC season to win the conference tournament for the second year in a row. In the NCAA tournament, Tennessee received a number two seed instead of the one seed Summitt believed her team deserved, and played North Carolina in the regional finals. Tennessee trailed from the beginning, fell behind by as many as 16, rallied to cut the lead to five, but ultimately fell 75–63. This loss marked the first time in five years Summitt would not appear in the Final Four. In the 2006–07 season, Tennessee defeated four ranked teams in a row: UCLA, Stanford, Arizona State, and Middle Tennessee, lost a regular season rematch with North Carolina and another game against top-ranked Duke, and defeated UConn for the third time in a row. Later, in Baton Rouge, the Lady Vols clinched the SEC title against LSU in a game where Candace Parker scored 27. However, in the SEC tournament semifinals, Tennessee fell to the Tigers. In the NCAA tournament, Summitt’s team easily made it to the Final Four, dispatching teams that included SEC foe Mississippi and 13-seeded Cinderella, Marist, winning each game by at least 14. In the Final Four, Tennessee again faced North Carolina. Despite shooting poorly, the Lady Vols came back from a 12-point deficit with 8:18 remaining to win 56–50. In the championship game against Rutgers, Tennessee won its seventh title. During the season, Summitt appeared at a men’s basketball game dressed in a cheerleader outfit and led the crowd in a rendition of “Rocky Top” to show her support for the team. A month earlier, her men’s counterpart, Bruce Pearl, showed up at a Lady Vols game in orange body paint. The 2007–08 season started off with the top-ranked Lady Vols going 3–0, including wins over 9th-ranked Oklahoma and 22nd-ranked Texas. The win over Texas was Summitt’s 950th. After two more wins, top-ranked Tennessee knocked off fourth-ranked North Carolina, 83–79, in a rematch of the previous year’s Final Four match-up. Tennessee won their next four games, then headed to California for a match-up with 5th-ranked Stanford. Down by 4 with less than 30 seconds remaining, the Lady Vols managed to tie the game up and send it to overtime, but lost, 73–69. The Lady Vols responded by winning their next seven games, giving them a 17–1 record going into a match-up with Duke. Candace Parker’s 17 points and 12 rebounds, including a bucket with 22 seconds remaining, helped the Lady Vols defeat the Blue Devils for the first time in four years, 67–64. Tennessee would win the rest of their regular season games and defeat LSU for the SEC Tournament Championship. The Lady Vols won four straight games in the NCAA Tournament heading toward their third matchup of the year against the LSU Lady Tigers in the Final Four. Alexis Hornbuckle tipped in a Nicky Anosike missed layup with 0.7 seconds left to win the game, 47–46. On April 8, 2008, Tennessee won its second consecutive national championship (and eighth overall) by beating Stanford 64–48. After the season, which ended with the Lady Vols losing to the eventual unbeaten national champion Baylor Lady Bears in the Elite Eight in Des Moines, on April 18, 2012, Summitt officially stepped down as head coach, ending her 38-year coaching career. Warlick was named Summitt’s successor. In a statement accompanying her resignation, Summitt said, “I feel like Holly’s been doing the bulk of it. 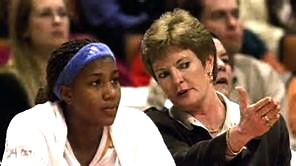 She deserves to be the head coach…” Summitt was given the title Head Coach Emeritus upon her resignation. According to NCAA regulations, as head coach emeritus, she was able to attend practices and assist Warlick in some duties, but was not allowed to sit on the team bench. Summitt finished her coaching career with 1,098 wins in 1,306 games coached in AIAW and NCAA Division I play. Summitt died at the age of 64 on June 28, 2016, at a senior living facility in Knoxville.